I’ve been back in Australia for more than a month and write final blog post has been on my ‘to do’ list ever since I landed at Sydney airport. Time flies when you’re having fun, but apparently it also flies when you’re settling back into your normal routine. I’m back at work, back at the gym, back dragon boating, back at Spanish class and back to my usual busy social life. Blogging has naturally taken a back seat. I’m still debating whether or not I have the time or the inclination to retrospectively blog about my South American travels, or whether this will be the final post for Honduran Hiatus. Another item on the ‘to do’ list is upload and organise trip photos. Sorting through my photos may well be the inspiration I need to start waxing lyrical about the last two months of what I’m affectionately describing as a trip of a lifetime. My last weekend in Honduras was spent with my host-mum and her friend Claudia in Gracias Lempira. It was a relaxing, terrifying and lovely way to end my trip. Gracias Lempira is a small colonial town famous for its aguas termales (hot springs). It’s about a six hour drive from Tegus in the north-west of Honduras. We left at about 3.30pm on Friday after work and arrived around 9.30pm that evening. My host-mum said the first thing we’d do after checking into our hotel was visit the hot springs. I thought she was joking, but she was serious. After four and half months of having a ‘night time is dangerous’ mantra drilled into me, I have to admit I was a little nervous at the thought of being out and about so late. Gracias Lempira is a tranquil and secure little town though, so people visit the hot springs at all hours with no worries. It was lovely. There were families and groups of friends and everyone was chilled out and relaxed. The water was the perfect temperature and I swear I fell asleep for a moment while floating. It was like being in a giant bath. We returned to the hotel just after midnight and as soon as my head hit the pillow I slept like a rock. Bliss. The next day we strolled around a local market before heading to a store that sold a huge variety of jarred and pickled fruits and vegetables, chutneys and chillies. 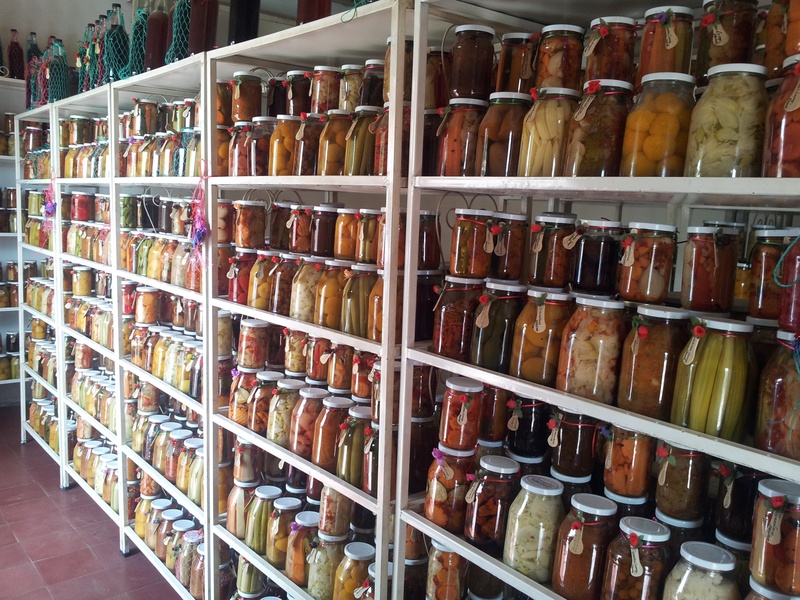 I loved all the vibrant colours and shapes in jar after jar lined up on their shelves. 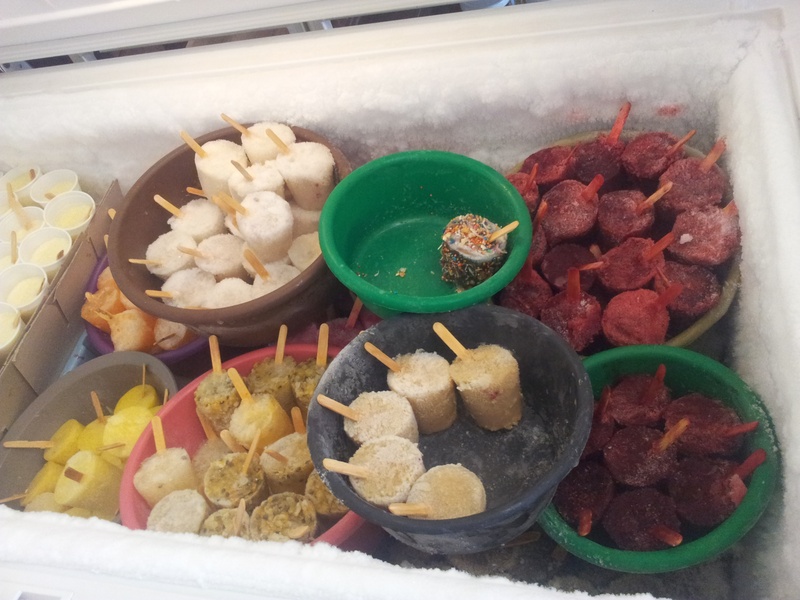 They also sold a range of natural paletas (ice blocks). I had a pineapple one on day one and a passion fruit one on day two. Both were delicious. That afternoon we headed out to an even smaller town called La Campa. This is where the terrifying aspect of the weekend comes into play. 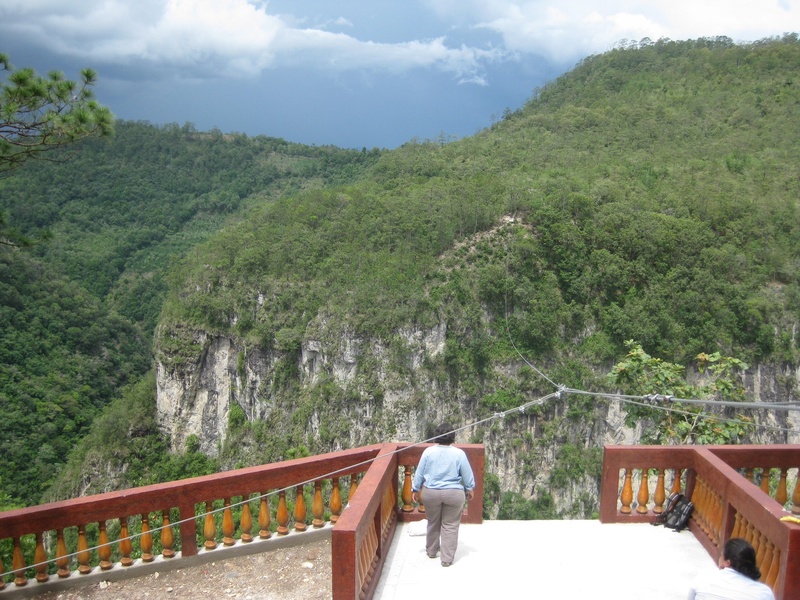 La Campa is famous for having Central America’s highest canopy zip line. There are six lines that zig zag across a canyon, the highest being more than 300 metres above the valley. My host mum and Claudia had both indicated they would throw themselves off the cliff with me, but once we were there and they could see the impressive drop they both chickened out. I was abandoned! The first line was the scariest. Waiting and watching the others only increased my nerves, but once I’d done the first zip line (and my hands and legs stopped trembling) it was simply a blast. This is a video of me on the second line. I was calm enough to hold the camera reasonably steady. And after the second line I even got up enough confidence to give myself a running start off some of the other platforms. It was a huge amount of fun. 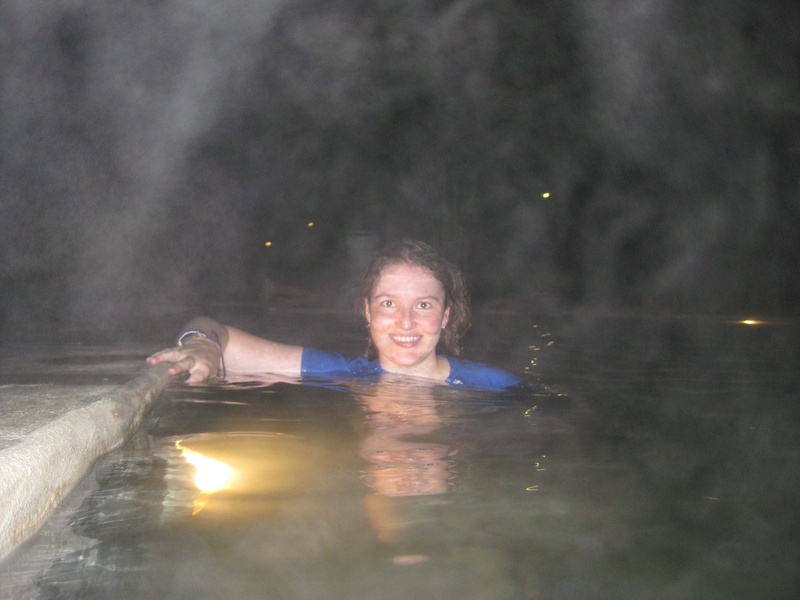 There are two sets of hot springs in Gracias so that evening we headed out to the other aguas termales. This time I remembered to take my camera, although it was a little difficult to take photos with all the steam. Before I knew it, Sunday had arrived and it was time to head home to Tegus after a brilliant weekend away. I’m dedicating this post to my host-mum, Suyapa. In our short time together she has travelled with me to an amazing number of Honduran cities and towns. I can’t express how grateful I am for her generosity and the time she’s dedicated to showing me her country and culture. She’s been a wonderful ‘tour guide’ and friend. I feel blessed to have been placed in her family and to have had her support throughout my stay. Suyapa, gracias por todo. ¡Le extrañaré un monton! A few weeks ago I officially resigned from my efforts to keep fit and eat healthy in Honduras. Declaring myself a lost cause, I relaxed all my standards and started eating whatever I wanted, whenever I wanted. Using “I’ve put on weight” as an excuse to relax your diet is not the smartest move, but I’ve decided to focus on weight loss when I’m back in the Land of Oz, not while travelling. Oh, how I emphasize with this! While I’m still able to fit into my pants, by the end of the day I can’t wait to get home so I can take them off and start breathing again. This week, believe it or not, both my regular taxi drivers made comments about my weight. And yesterday JC said to me, “You’re going to return home a little fat, aren’t you?” This sounds harsh in English, but said in Spanish it’s not quite as offensive. It still stung a little though. Not as much as being asked if I was pregnant (who does that?) but it’s never nice to be reminded you’ve porked up. Despite the weight gain, I wouldn’t class my pre-emptive strike program as a failure. My main aim, if you recall, was to lose enough weight before I head to Honduras that it will offset the extra padding I expect to acquire while over there. And I’ve been successful in that respect. Late last year I was about 10 kilos over weight, which I lost before leaving Australia, but then put on again in Honduras. If I hadn’t conducted my pre-emptive strike on rice and beans I would have arrived in Honduras 10 kilos overweight, put on another 10 kilos and returned home 20 kilos heavier than I should be. Plus I’m harboring the (slightly delusional?) hope that during my 7 weeks of backpacking through South America, all the walking will miraculously melt away my extra kilos. Never mind all the delicious South American food I’ll be eating. Now, if you’ll excuse me, I’m off to find some chilenas de leche. Now that I’ve reached my final week in Honduras, I’ve decided to remove my self-imposed ban. 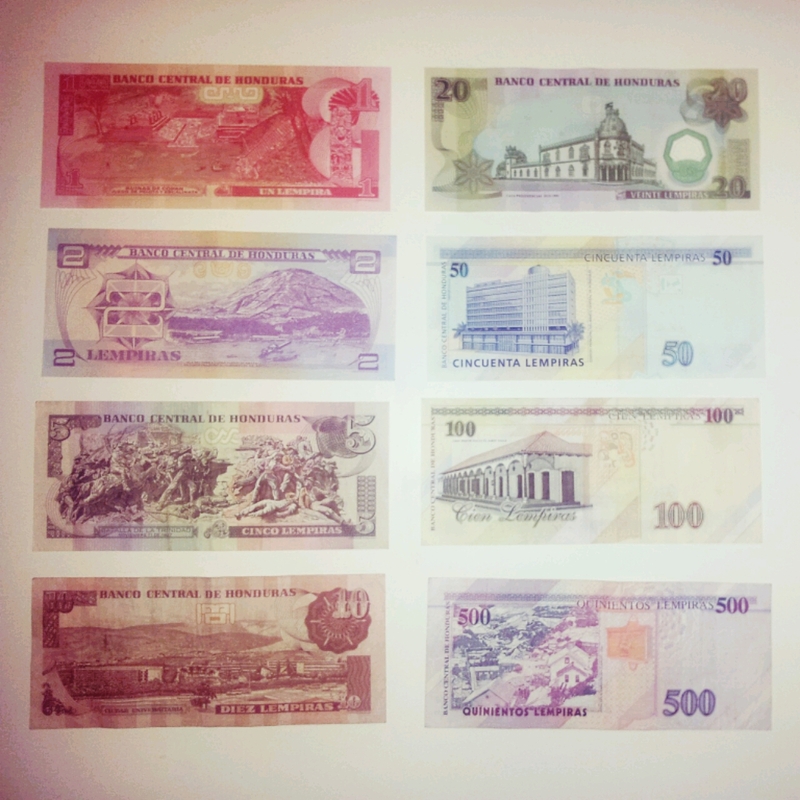 The Honduran unit of currency is called the Lempira (HNL). 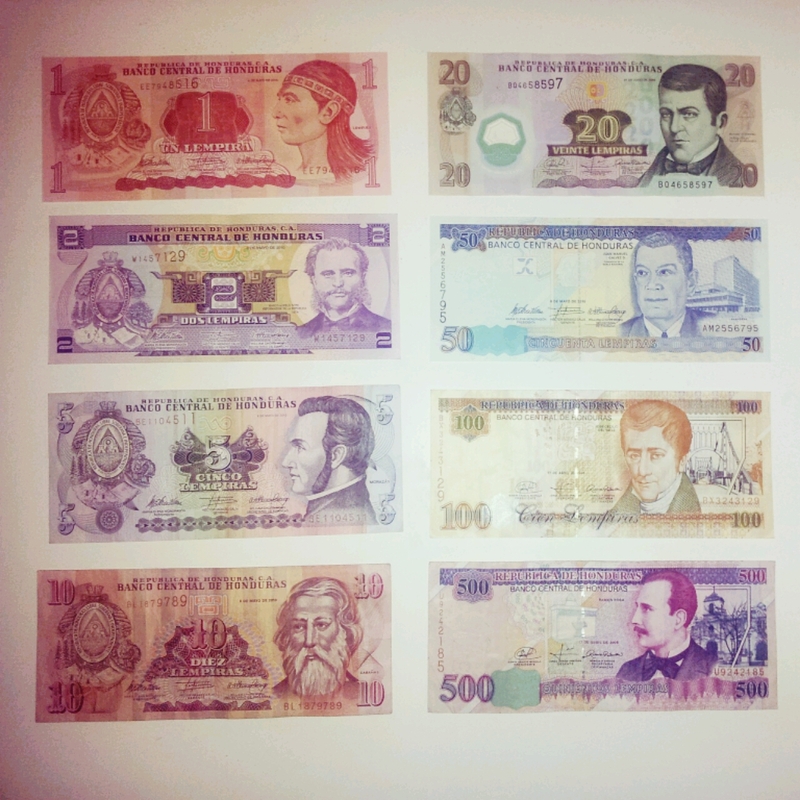 Twenty lempiras is roughly the equivalent of one US or Aussie dollar. Compared to Australia, everything here is cheap. After a few weeks of mentally converting prices from lempiras to dollars, I gave up the habit as I never found a price tag that was cost-prohibitive. It’s funny how quickly you get used to the new ‘normal’. In my first month here I decided a second pair of jeans would be a useful addition to my wardrobe so went shopping. I wandered around the local equivalent of Myer* until I found a pair of jeans that not only fit, but were on special for HNL$525. *A department store called ‘Carrion’, which always makes me imagine vultures feasting on dead animals. Five hundred and twenty five. That seems like a fairly large amount. Especially when you write it out in words and not numbers. I ummed and ahhed for about 20 minutes. Did I really need that second pair of jeans? Was it worth spending so much money? Were there other more important purchases I should direct my budget towards? My indecisiveness was quickly eliminated when it occurred to me HNL$525 was only AUD$27.50. Not a huge expense and certainly not worth the 20 minutes of dithering. But when you consider the family I met with TECHO had an income of $4750 lempiras per month, HNL$525 suddenly looks like a huge amount of money again. And the Zara jeans I saw for HNL$1190? Exorbitant. I guess it’s all relative. Five hundred and twenty five. A pittance for some, a huge amount for others. Which leads me to the best $25 I’ve spent while here in Honduras. It was a $25 Kiva loan to Don José so he could buy raw ingredients for his business, selling breakfasts and lunches in San Pedro Sula. If you haven’t heard of Kiva I strongly encourage you to check out their website and consider making a loan. $25 probably isn’t much for you, but it can make a huge and lasting difference to a Kiva loan recipient. Note: I have no affiliation with Kiva, apart from having made several loans; I just think they’re a super organisation and well worth supporting. I am a voracious reader. Ever since I learnt how, I’ve loved to read. From the three AFS camps we attended together, the other participants are well aware of the joy books give me. During any free time my head was invariably found in a book. At our end-of-stay camp one of the girls asked me how many books I had read while in Honduras. I had no idea, but when I got home I decided to look through my Kindle purchase history and work it out. I was surprised by the final number. I knew I’d read a lot, but my final list of books read (which I’ll copy below) was a lot longer than even I had expected. Recently* I’ve been going through a fantasy/paranormal/dystopia phase, so most of the books are in those genres. *Recently? Who am I kidding? I’ve loved books of a fantastical nature ever since I was a girl of eight and I received a book on Greek mythology as a gift. It may be a little geeky, but I’m fascinated by the world building in these novels and enjoy their escapism. A Dance with Dragons (A Song of Ice and Fire: Book Five) * Martin, George R.R. A Feast for Crows (A Song of Ice and Fire: Book Four) * Martin, George R.R. A Storm of Swords (A Song of Ice and Fire: Book Three) * Martin, George R.R. A Clash of Kings (A Song of Ice and Fire: Book Two) * Martin, George R.R. A Game of Thrones (A Song of Ice and Fire: Book One) * Martin, George R.R. I also need to add 11 Mills and Boon romance novels to the list, but I’m sparing myself the embarrassment of listing their individual titles. So that’s 73 books in total. In four and a half months. An average of 4.1 per week. You’d be forgiven for thinking that I’ve done nothing but read the whole time I was here. But believe it or not I have actually put my books aside every now and then. Every time we’ve taken the highway north I’ve been fascinated by these animal advisory signs. Either the rabbits here are a LOT bigger than the ones we have back home or someone has seriously overestimated the damage a rabbit could do to a car. I really can’t think of a rabbit vs car scenario where the car would come off second best. 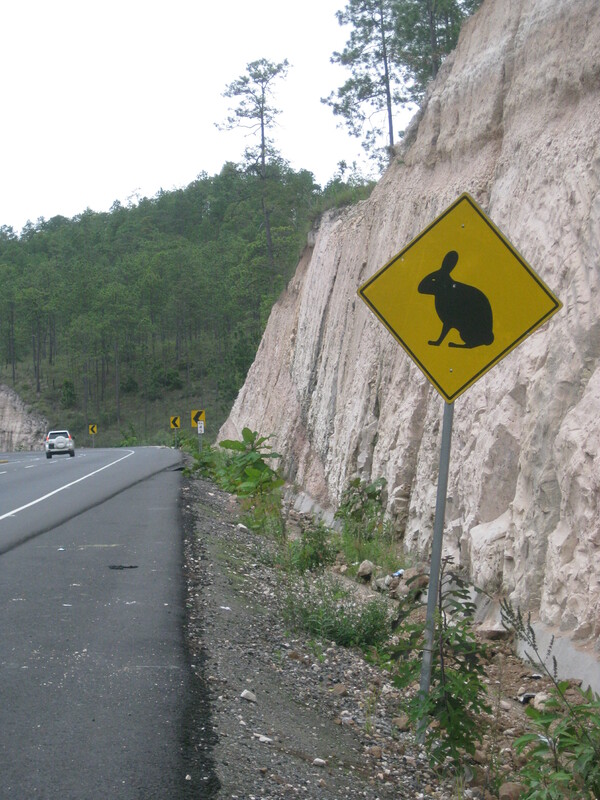 Whenever we pass these signs I always joke with my host mum that we’ll have to keep a careful eye out for the gigantic rabbits. They could be dangerous. Never mind the cows, horses, donkeys and dogs we’ve regularly seen (and slammed on the breaks for) on our highway travels; it’s the oversized rabbits you really need to worry about! I have a week and a half left in Honduras. As the old proverb goes, time flies when you’re having fun. And my 132 days here have certainly flown. I’ve started thinking about what I’ll need to do and what I want to do when I get back home. Things like buying a new car, finding a place to live, and finally sorting through my boxes of belongings stored at dad’s place. I’ll need to start back at work, start back at the gym, and start paddling again with my beloved Diamond Phoenix dragon boat club. I’ve been daydreaming about (and drooling over) what foods I’ll eat first (lamb chops, dad’s spare ribs, and pavlova) and which favourite restaurants I’ll visit (Shanghai Dumpling Café, Sammy’s Kitchen, and The Artisan). As I was mentally compiling ‘to do’ lists in my head I suddenly realised I’m not quite on the home stretch yet. While my time in Honduras is ending I still have seven weeks of travel ahead of me. Seven weeks! That’s a really long holiday. It’s definitely going to be worth it though. Vic and I have planned what I’m sure will be the trip of a lifetime. We haven’t planned everything down to the last detail (unusual for me) but have a holiday mix of pre-organised tours and choose-your-own-adventure days. I think this will work well; provided my obsessive compulsive side can cope without always having a plan. I have mixed feelings at the moment—I’m sad to be leaving Honduras but also really, really excited about my upcoming South American adventure. Sun, sand and surf. Swimming, snorkeling and sunbathing. Just another day in the Islas de Bahía (Bay Islands) of Honduras. Last week my host-mum and I spent a lovely and relaxing four days on the Island of Roatán. We drove from Tegus to the northern coastal town of La Ceiba and then took the hour and a half ferry ride to the island. Las Islas are made up of three main islands: Roatán, Útila and Guanaja. 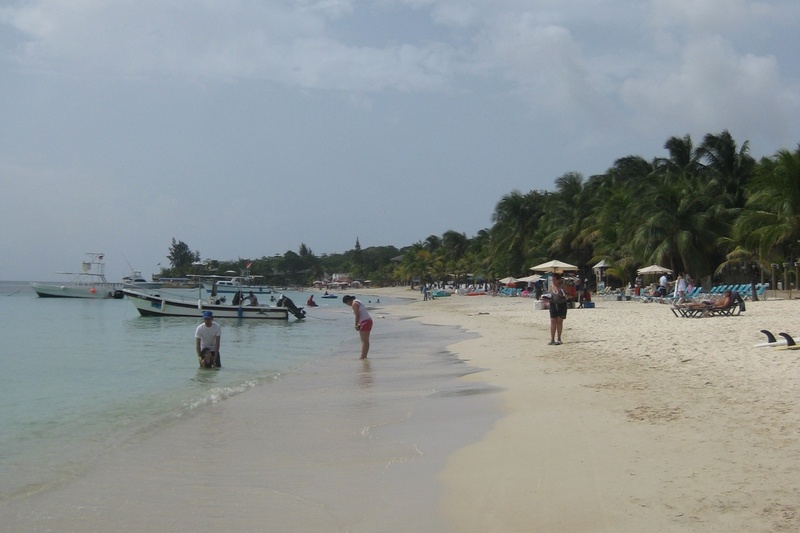 Roatán is the largest of the three and has two main tourist areas, West Bay and West End. Útila is known as one of the best (and cheapest) scuba diving sites in the world. Guanaja is the smallest island, with less tourism, and is only accessible by plane or a twice-weekly ferry. We stayed in West End, which has the most nightlife and a large variety of bars and restaurants. We also visited West Bay, which has a beautiful beach and is the location of some of the slightly more upscale resorts. 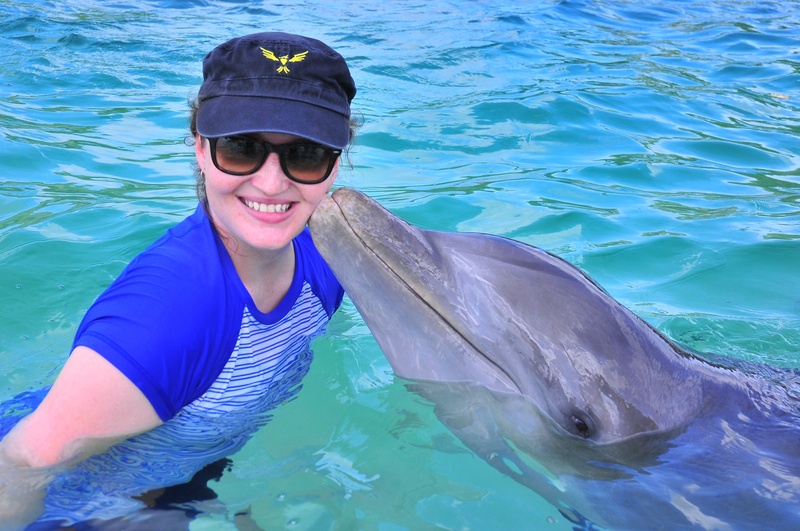 One of my favourite moments of the trip was getting up close and personal with a dolphin at Anthony’s Key Resort. 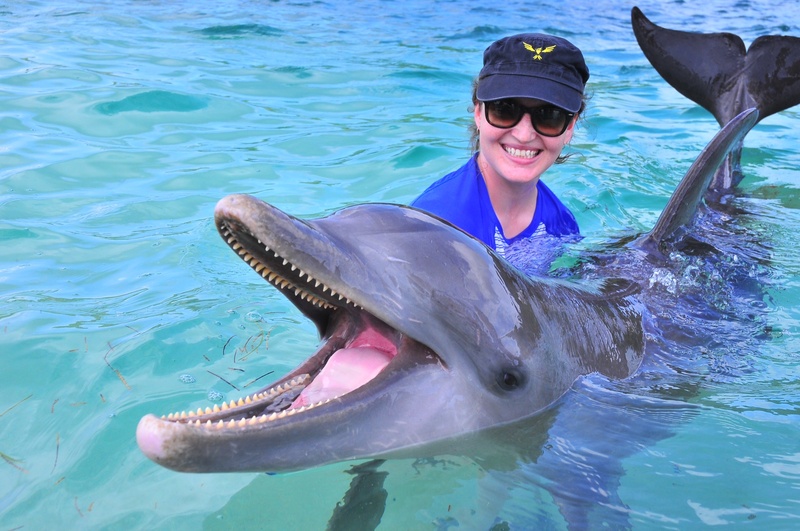 Meeting a dolphin has been on my bucket list for a long time so I was ridiculously excited to be introduced to the lovely Mr. French. He even gave me a sweet little dolphin kiss on the cheek. It was a really entertaining afternoon, and meeting Mr. French is a moment I’ll treasure for a long time to come. Another special moment occurred when I went snorkelling in the small bay our hotel fronted. I saw my first ever cuttlefish. Five of them in fact! It took me a couple of moments to work out what I was seeing. I thought they might have been squid, but then from the shape of their little bodies I realised what they were. The cuttlefish were tiny and a very pretty brilliant blue. I’m not sure where they were headed, but I trailed behind the little cuttle club for a few metres, before they spooked and swam away faster than I could follow. 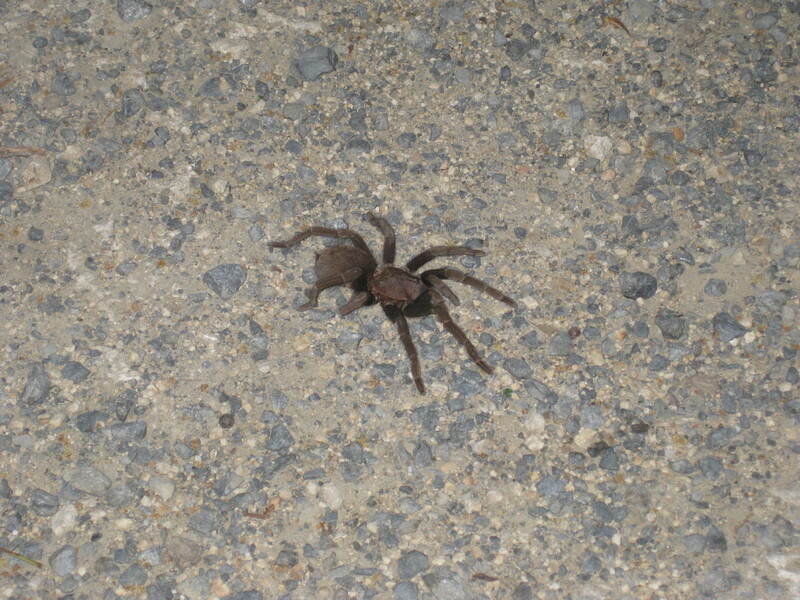 In a not so special moment, I also met my first tarantula on one of the hotel paths. It’s a bit hard to tell from the photo, but trust me, it was a very large spider. I checked my bed very carefully before going to sleep that night. I’m not sure how common it is for creepy crawlies like these to be found inside, but I certainly didn’t want one as a bed fellow. 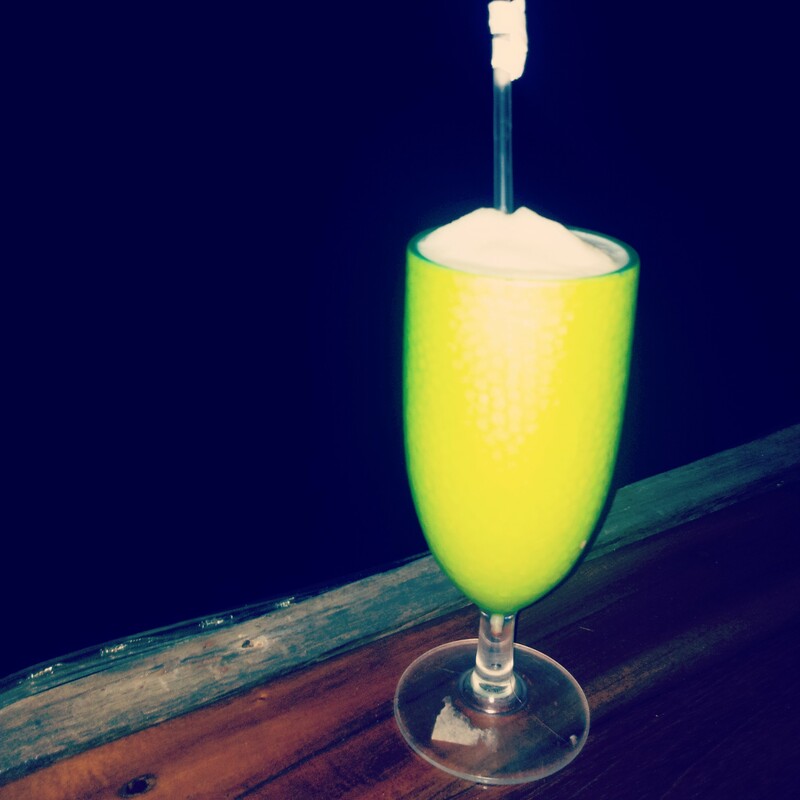 And what beach holiday can be called complete without a refreshing piña colada? Before I knew it, our holiday was ending and it was time to catch the ferry and start the drive home. Our pre-road trip breakfast in La Ceiba was baleadas de la linea. These are baleadas sold from street stalls located where the railway line used to run. The baleadas were yummy, but best of all I suffered none of the potential aftereffects that can occur when eating street food. I must be toughening up! The game was scheduled for 7pm, but the gates opened at 1pm. We arrived at 4.30pm and I was amazed at the number of people already in the stadium. 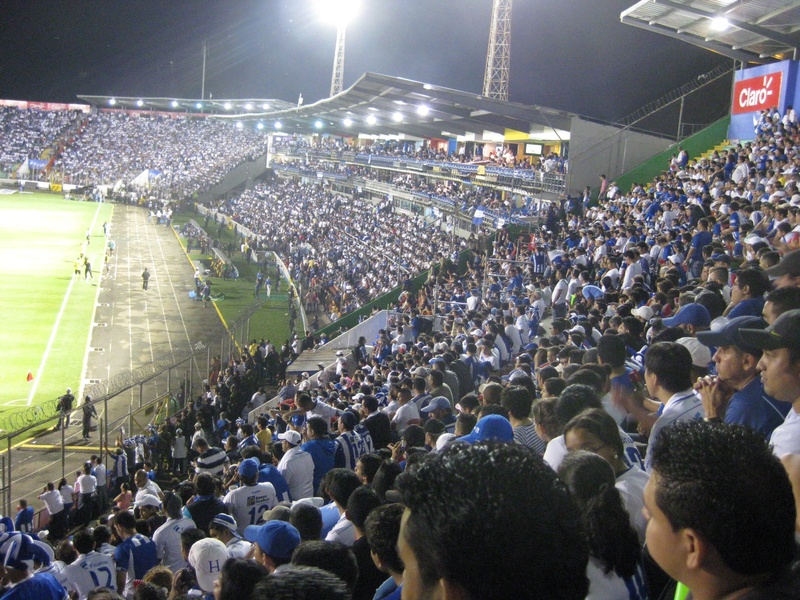 At full capacity el Estadio Nacional can hold 38,000. It didn’t end up being a sold-out match but the crowds were still impressive. 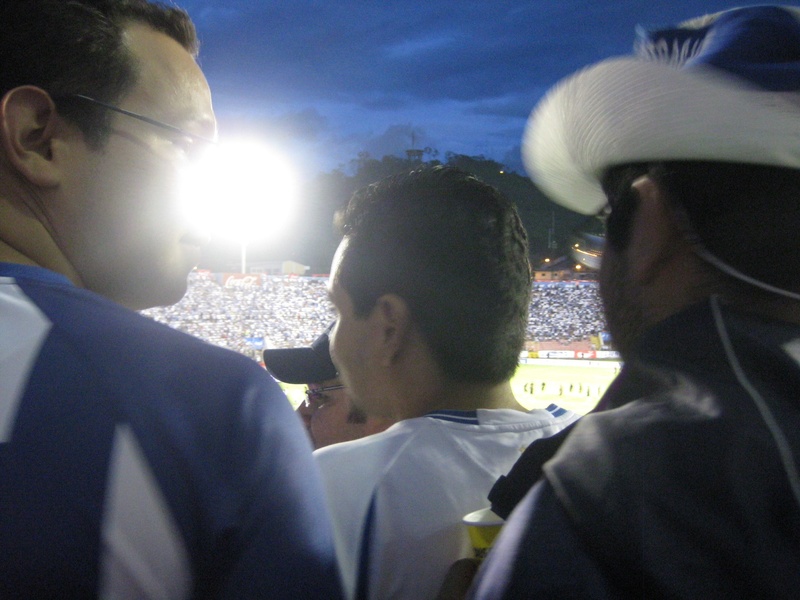 Everywhere you looked there was a sea of blue and white (the Honduran team colours). And the noise! The game didn’t start for another two and a half hours, but already the crowd was yelling and cheering, blowing horns and banging cardboard. The cacophony was overwhelming. It’s a little shaky, but I recorded about 30 seconds of footage, which will give you an idea of what it sounded like. Fortunately they sat down once the game started, and only stood up when there were goals or close calls. And the only goals to be seen were ours! Honduras won 2-0! Woot. The atmosphere in the stadium was electric, but when Honduras scored a goal it was like 10,000 volts had been sent through the crowd. Everyone jumped to their feet, yelling, screaming, hugging and throwing full cups of beer in the air. Full cups of beer and full cups of urine too, apparently. Eww! My friend had warned me earlier there was only one set of bathrooms at the stadium. They would most likely be in an appalling state, so it was best not to drink too much and avoid using them. Others who want to drink, but also don’t want to use the bathrooms, pee in their empty cups. I’m not 100 per cent sure how one achieves such a feat discretely, surrounded by nearly 38,000 people, but apparently it’s a ‘thing’. All the amber liquid flying through the air after a goal is scored isn’t necessarily beer or Mountain Dew. Luckily, not a single drop landed on me so I didn’t have to worry about the unidentified flying liquids. My only moment of worry was when a fight nearly broke out between two men in the rows in front of us. About 10 police officers with massive batons pushed their way down to the arguing spectators, directly in front of our seats. There was a very tense stand-off, but after a few nerve-wracking minutes the situation was diffused and everyone went back to observing the game. Watching it all unfold was quite frightening, and I was very relieved when it blew over. I’m not sure what the confrontation was about. It was between two Honduran supporters so wasn’t team rivalry boiling over. I think I counted a total of five Jamaica supporters in the entire stadium. If I were them I would have been very intimidated, although the police presence, as promised, was massive. 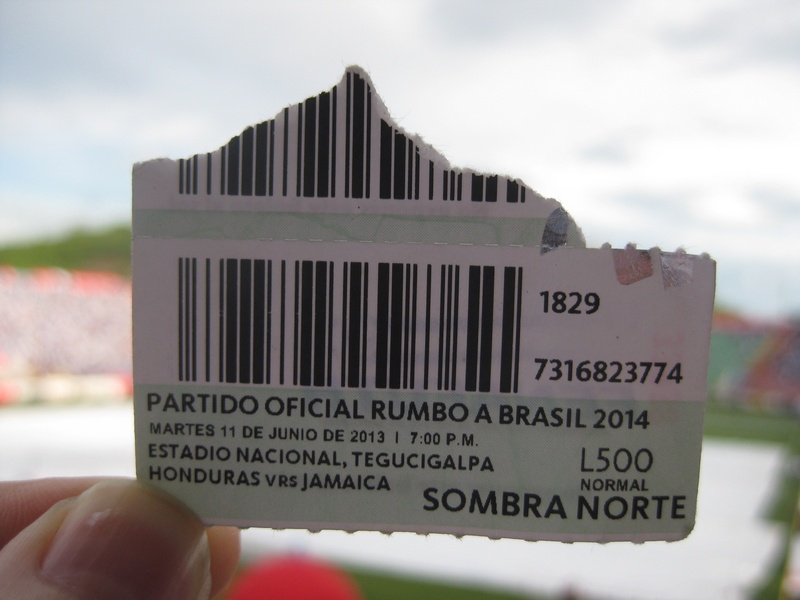 They were spaced out about a metre apart across the top and bottom rows of the estadio. Earlier on they also marched a lap around the soccer field in what I assume was a show of force. At the end of the game the police, in full riot gear, lined up to make sure the players were able to exit without being mobbed. Although considering there was razor wire on top of the fences separating the seats from the field, it would be difficult for a spectator to cross the barrier. All in all it was a very exciting afternoon. Honduras’ win meant the crowds leaving the stadium were elated and I was thrilled to survive my trip to the big bad Estadio Nacional with no major incidents.